What is the Legislative Reference Library? The reference library is located within LRO and is essentially the Legislature’s public policy resource center. The library houses a collection of more than 6,000 titles, including reference materials, books, periodicals, and state and federal government documents. The library catalog is accessible to legislators and legislative staff via the UniNet. The collection includes the Nebraska Reports (which report opinions of the Nebraska Supreme Court) dating back to 1901. 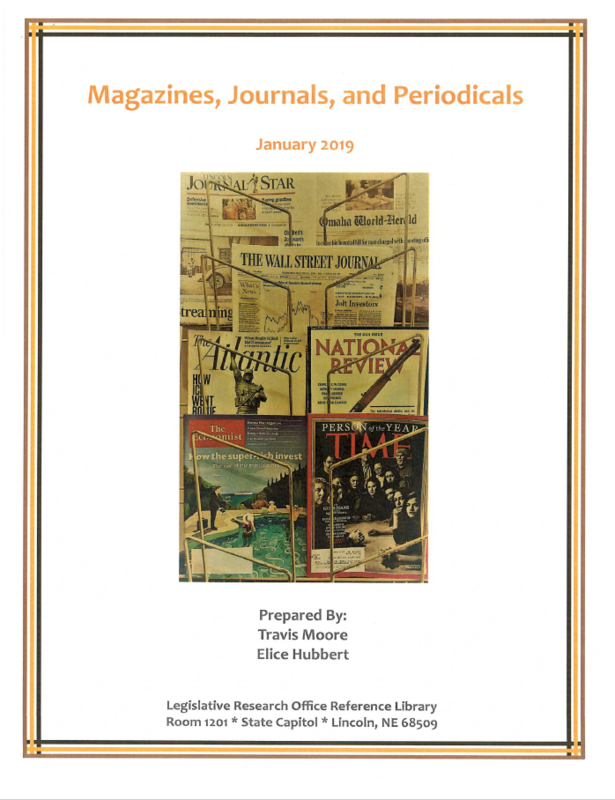 The library also includes numerous interim study reports, the Nebraska Legislative Journals, and the Laws of Nebraska (Session Laws) dating back to 1855. 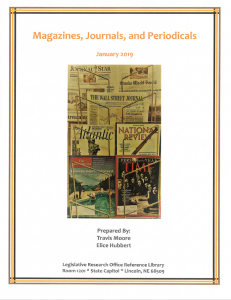 The library subscribes to 49 periodicals, relating to a myriad of public policy issues, which can be sent directly to senators and their staff. Finally, the library subscribes to the Lincoln Journal Star, Omaha World Herald, New York Times, and Wall Street Journal. What if I need something you don’t have? If we don’t have something, we’ll do everything we can to find it. We offer InterLibrary Loan, which provides access to the combined catalogs of approximately 15,000 libraries, and have access to several other databases that can be searched to find a needed resource. In some instances, requested material can also be purchased and added to the collection. The library regularly publishes an acquisitions list of materials that have been added to the collection.